I always do my best post-christmas sale shopping online, from home, preferably whilst luxuriating in my pjs. Over the past few days I have done plenty of 'research' and there's some great bargains to be had. If you like cashmere (like me! ), you're in luck. 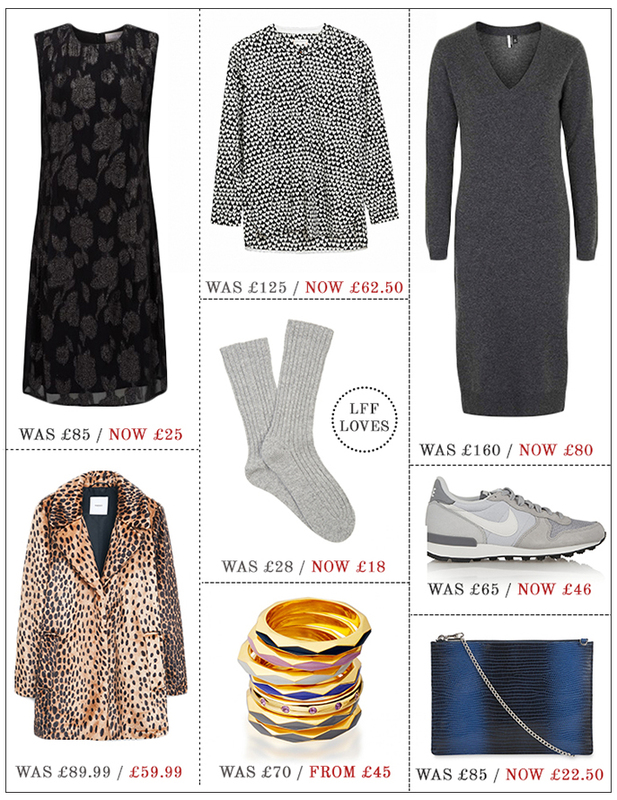 Warehouse and Topshop have some great buys including the wear-forever jumper dress below with 50% off. The Whistles sale is also impressive; there are some bargain leather goods including the classic Rivington cross body bag which is down to a cheap-as-chips £22.50. There's also some fab party wear in the Atterley sale - Christmas may be over, but there's always room for a glam LBD in my wardrobe! Left column top - bottom: Black lily jacquard dress, Atterley. Leopard faux fur coat, Mango. Middle column top - bottom: Heart printed shirt, Chinti and Parker. Cashmere bedsocks, Warehouse. Stacking rings, Astley Clarke. Right column top - bottom: Cashmere dress, Topshop. Nike sneakers, Net-a-porter. Rivington cross body, Whistles.